If you subscribe to Globe Broadband wired internet most likely they will bundle Aztech DSL5001EN or DSL5018EN modem for free. That will serve as your router also to access World Wide Web. Usually their technician or installer doesn’t teach you how to access the router settings, they just give you the credentials like username and password if you’re on PPPoE connection. Others will just demonstrate to you that internet is now working. They will also inform you that the default WiFi password is located on the modem’s back. When time come that your internet goes wrong and encountered problems like no internet connection, slow to intermittent you may think of ways to resolve it on your own. You may decide to access the modem but don’t know the details. Here we’ll list you possible ways to access to modem or router web page GUI. This is not advisable if you don’t know what you are doing as this may result to misconfiguration if you changed the current settings. If the IP above doesn’t work, you may try checking it via command prompt. See below on how to do it. 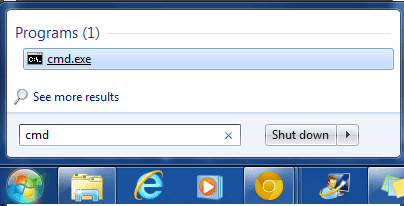 Go to Windows Start button, then type cmd on the search box. Click on cmd.exe on the above result to open the command prompt. See image below for reference. Usually DHCP server IP is your Aztech Modem IP, use that IP to access your router web page. Or if you’re on static IP, you can directly type you IP at the web browser then it will point you to router admin page. Just type the admin username and password to access advance settings to administer your modem or router. That’s it guys, hope it helps you. Feel free to hit the comment box if you have questions and answers to help others.